10+ FRESH Seeds. Madagascar Palms are not actually palms, but a long-lived, semi-succulent plant which requires very little water. It thrives in full sun and needs very little attention. Perfect for xeriscaping in warm zones, or as a potted plant in any zone, but won't tolerate frost. 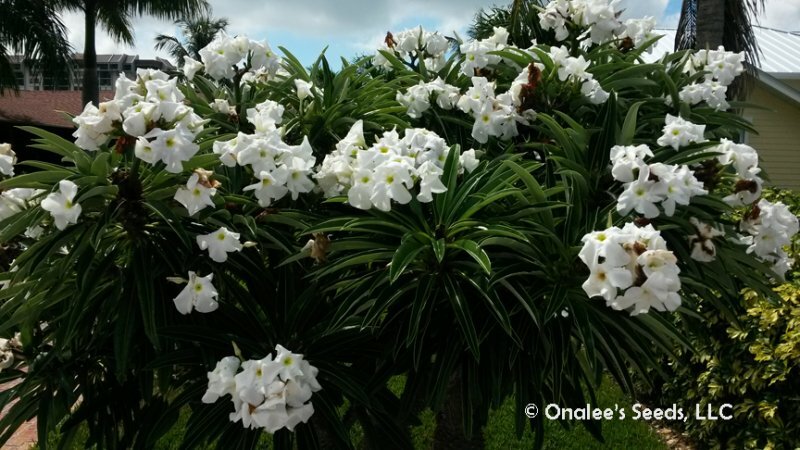 In the summer, clusters of fragrant, white flowers will appear on mature plants that are grown outdoors. 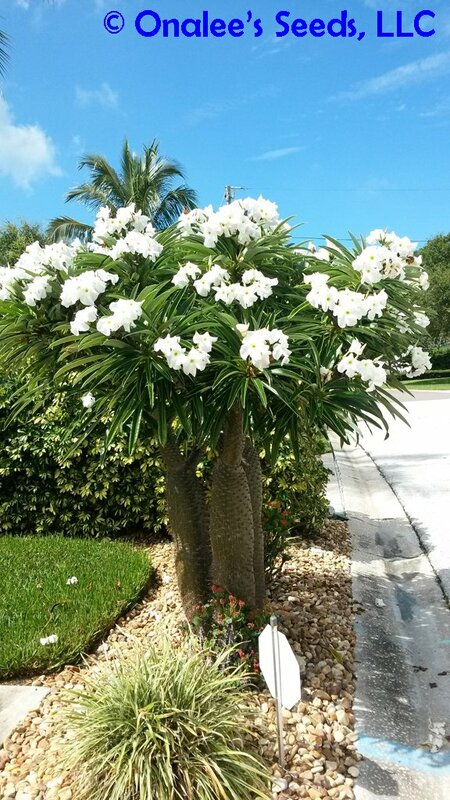 10+ Seeds of Madagascar Palm, Pachypodium lamerei with planting and growing instructions. Hardy zones 9-11. May be grown in pots in any zone and brought indoors for the winter in colder climates. Madagascar Palms are not actually palms, but a long-lived, semi-succulent plant which requires very little water. 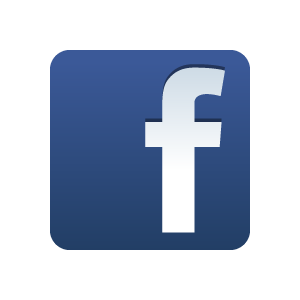 It thrives in full sun and needs very little attention. Perfect for xeriscaping in warm zones, or as a potted plant in any zone, but won't tolerate frost. In the summer, clusters of fragrant, white flowers will appear on mature plants that are grown outdoors. Be sure to move potted plants outdoors for the summer, after all danger of frost has passed and temps are suitably warm. 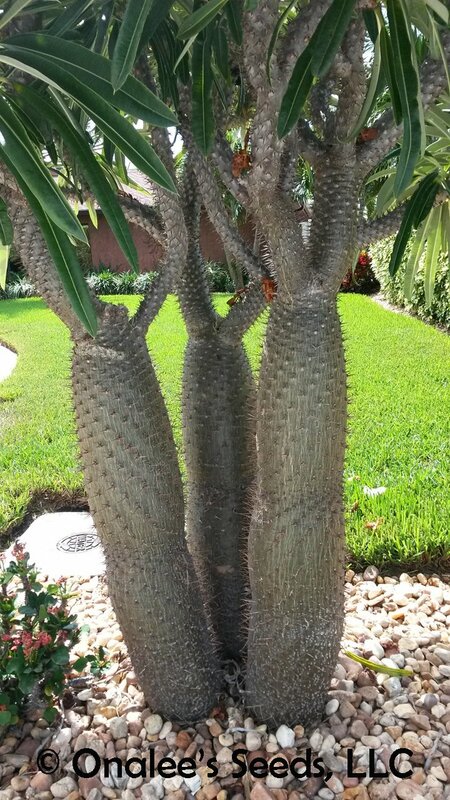 This popular Pachypodium has a shiny silver trunk covered with long, sharp spines. The trunk may branch out, making it even more attractive. A tuft of long, narrow leaves grow only at the top of the trunk, like a palm tree. However, it isn't really a palm but a succulent from the Apocyanaceae family. Seeds must be sown when fresh, they do not store well. Be prepared to sow seeds soon after receipt.